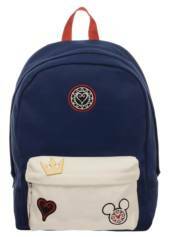 Carry all your books on your adventures with this Kingdom Hearts-themed backpack! Featuring a large main pocket, front pocket and adjustable straps, this bag also has themed patches to really show your love for the game! KINGDOM HEARTS KEYBLADE COLLECTION VOL.01 KINGDOM HEARTS MINIMATES SERIES 3 ASST. KINGDOM HEARTS 3 SOLDIER HEARTLESS 5-STAR VINYL FIGURE KINGDOM HEARTS 3 SORA & HEARTLESS VYNL.